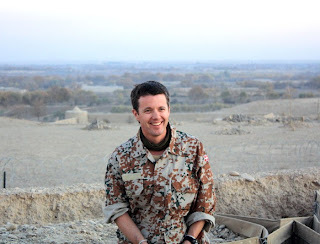 Danish Crown Prince Frederik had a long held wish fulfilled last week as the Danish govern- ment allowed him to visit the Danish NATO troops in the southern Afghanistan province of Helmand. Frederik, 40, was earlier reported as being frustrated by the refusal of the government and the military to give him permission to spend some time with the troops, as colleagues as Spain’s Prince Felipe, Holland’s Prince Willem-Alexander and the British royals Charles, William and Harry had been able to do. But upon his return from Thailand Crown Prince Frederik flew to Afghani- stan in the company of the Danish Minister of Defence. Frederik and the minister were able to experience first hand how the 700 Danish soldiers live at the front, eating the same food and sleeping in sleeping bags. 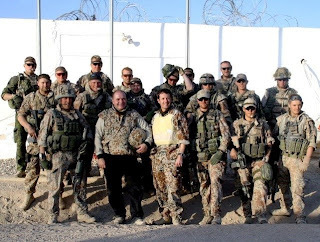 Most of the Danish troops are based in Helmand. Seventeen Danish soldiers have been killed in Afghanistan since the Kingdom of Denmark joined the U.S.-led coalition in 2002. Morocco's Princess Lalla Salma, spouse of King Mohammed VI, deliverd a speech at the opening of the 15th International Conference on AIDS and STIs (Sexually Transmitted Infections) in Africa (ICASA) in the capital of Senegal, Dakar, on December 3, 2008. International and African experts evaluated the current state of the HIV and STI epidemics with regard to science, communities and leadership. The princess had urged in an address at the opening of the conference, which gathered about 7,000 participants, a constant mobilization and an active, joint, efficient and better targeted cooperation at the regional and international levels to combat AIDS. She also stressed the importance of adopting a global approach that takes into account the various medical, sociological and psycho-cultural aspects. Lalla Salma also took part in the special session of the African First Ladies, which examined the role of first ladies in awareness raising about AIDS. The princess has received the 2008 ICASA Award for her commitment to combating the disease, and was awarded by Senegal’s highest decoration, the Grande Croix de l'Ordre national du mérité, for her merits for her humanitarian work in Morocco and abroad.